Well, that's one way to make people pay for puns. The New York Post, that bastion of fair, balanced, and not-at-all sensationalistic reporting, has blocked iPad owners from reading its stories through the tablet's Safari browser. If folks want the full spill on Hugh Hefner getting ditched at the altar, they'll be prompted to download the iOS app, which requires signing up for a subscription starting at $6.99 on a month-to-month basis. Setting aside News Corp.'s hubris for a moment, what's odd about this is the number of workarounds Rupert Murdoch & Co. left us cheapskates. You can still read the site on a desktop browser or a phone, including an Android one. Basically, then, News Corp. is strangling web access, but only for a select group of readers. That's a stark contrast from other content providers (even the News Corp-owned Wall Street Journal), which have been more platform-agnostic. Then again,there's the dim possibility that News Corp. targeted the iPad in an effort to re-brand the Post as a glossier sort of tabloid, à la The Daily. To which we say, that's some wishful thinking there, Rupe. 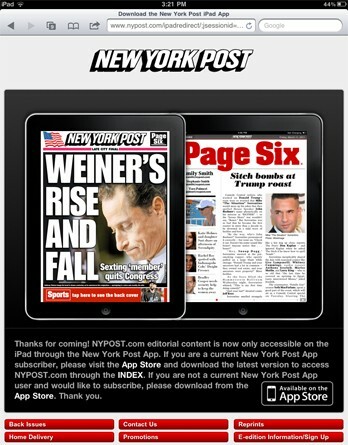 New York Post blocks iPad access through Safari browser, hopes you'll pay for a subscription instead originally appeared on Engadget on Sun, 19 Jun 2011 16:02:00 EDT. Please see our terms for use of feeds.